Revised Suzuki Vitara SUV Launched in Ireland & On Sale Now. Revised Suzuki Vitara – On Sale Now. First introduced in 2015, the Suzuki Vitara has earned high acclaim for its stylish, city oriented design, compact and easy to manage dimensions, good on-road performance and genuine off-road capability. 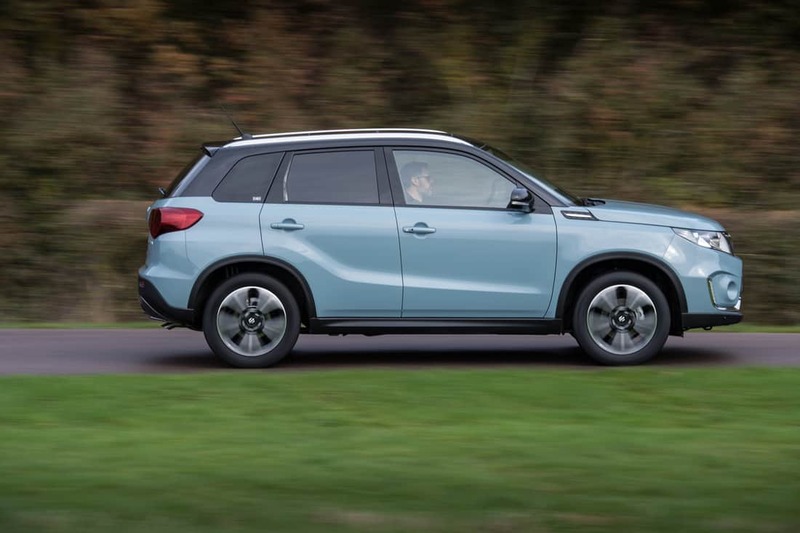 For 2019, the Vitara recieves various styling upgrades, new engines and an even higher level of technology and safety features. The Vitara is produced at the Magyar Suzuki plant in Hungary. 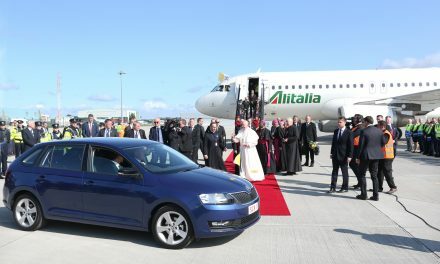 This plant also produces all S-Cross models for European markets as well as exports around the world. 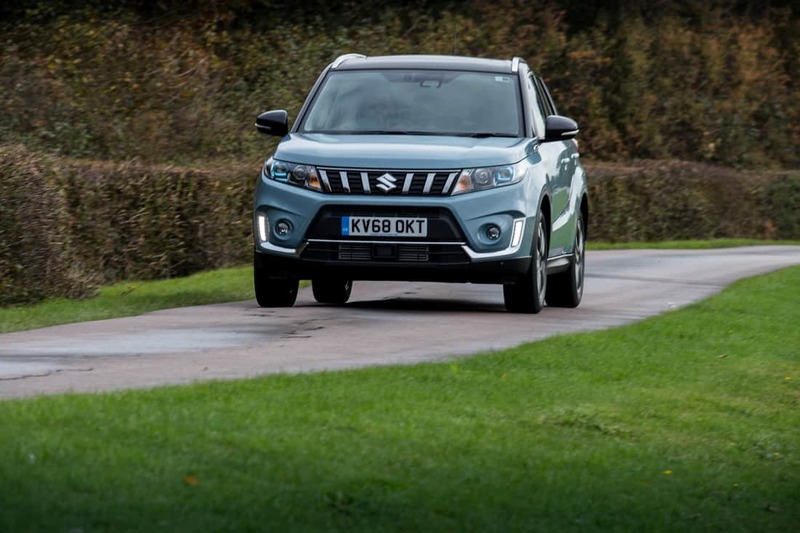 The Vitara expresses Suzuki’s SUV styling heritage in a strong looking design. The clamshell bonnet (a hallmark of Vitara models) gives the front end a look of solidity, and a trapezoid motif front bumper indicates powerful grip on the ground. Pronounced body side character lines and bonnet side louvres form motifs are reminiscent of the first generation Vitara from 1988. Suzuki’s pursuit of good aerodynamics is reflected in optimally designed bumpers, in a roof line that slopes smoothly downward toward the rear, in flat underbody surfaces, and in specially shaped side mirrors based on the results of airflow analysis. 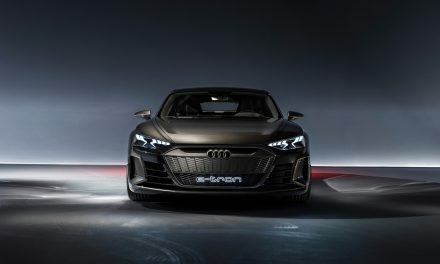 The 2019 model incorporates a new, more elegant front face with redesigned grille and lower bumper and the rear lamps have now been redesigned with a distinctive LED display. For the interior, a new seat trim design is utilised for the range and suede seat fabric is fitted on SZ5 models; the upper instrument panel is upgraded to a soft touch material and the instrument cluster now features a central colour information display. A full standard equipment table for the Vitara range is listed at the end of this press pack and also on the media website. Standard equipment for all Vitara models is comprehensive and the SZ4 model includes seven airbags, alloy wheels, USB and Bluetooth connectivity, cruise control with speed limiter, auto air conditioning and front and rear electric windows. SZ-T adds new design 17-inch silver painted alloy wheels, rear privacy glass, white stitching for seat trim fabric, Smartphone link audio and navigation system. Moving up to SZ5 adds LED Projector headlights, 17-inch polished alloy wheels, suede seat fabric, keyless entry with start button, Traffic Sign Recognition (also fitted on ALLGRIP models), blind spot monitor, Adaptive Cruise Control, Dual Sensor Brake Support and Panoramic sunroof. 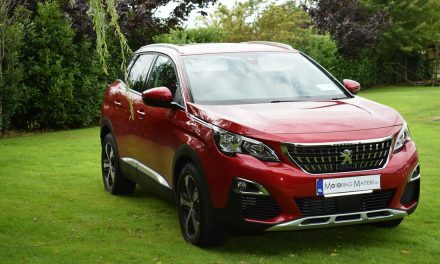 The 2019 model is available in two new dual-tone colours which are Solar Yellow Pearl and Ice Greyish Blue. A total of 11 different shades are available in the Vitara range of which one is a solid colour, four are metallic finish and six are dual-tone metallic finish with Cosmic black roof colour. After the debut of the 1.0-litre three cylinder Boosterjet in Baleno, S-Cross and Swift, this engine technology is now extended to the Vitara. Offering the same level of power and torque of a much larger capacity normally aspirated engine (1.7-1.8-litre), it delivers an effortless drive and genuine driving pleasure. This unit has an output of 111PS and is also Direct Injection turbocharged (DITC). The engine has very compact dimensions and offers 170Nm of torque available from 2,000rpm through to 3,500rpm. The optional six speed automatic transmission model offers 160Nm of torque which is available slightly earlier from just 1,800rpm through to 4,000rpm. Boosterjet technology is developed by Suzuki and is characterised by improved fuel efficiency and driving pleasure made possible by using a small displacement, high torque turbocharger. By controlling the wastegate valve, which closes to create higher boost pressure during heavy load operation and remains open during normal driving, the Boosterjet system reduces pumping loss, thus achieving high levels of both power and fuel-efficiency. An air bypass valve is also utilised to prevent turbo ‘stall’ after the throttle has been closed and then quickly reopened. The 1.0-litre engine employs six-hole fuel injectors and high tumble port technologies to inject fuel with a high combustion efficiency to provide greater fuel economy and improved power output. Fuel is injected at a pressure of 35 Bar into the combustion chamber during the air intake stroke which then forms a rich mixture around the spark plug and leaner mixture around the outer edge of the piston. The tumble flow of the fuel is created by utilising a straight intake port and a complex shape piston crown design. The Boosterjet engine was developed with Suzuki’s ethos of reducing weight and size with added response and smooth power delivery to achieve the characteristics that Suzuki engines are renowned for. This engine also utilises a variable fuel pressure control system that optimises the amount of fuel injection according to driving conditions. This helps promote fuel atomisation and also improves fuel combustion efficiency. During development, Suzuki’s engineers virtually eliminated the typical delay in turbo power delivery or ‘lag’ by attaching the compact turbo charger directly to the cylinder head as well as incorporating the exhaust manifold into the cylinder head casting. This design ensures optimum gas flow with minimal heat loss through to the turbo unit. The turbocharger has a boost pressure of 1.0 Bar and is manufactured by IHI. Historically, power and torque delivery from a turbo-charged engine would not have been available until much higher engine speeds, offering less flexibility to the driver. The 1.0-litre engine offers strong benefits in performance too with 0-62mph acceleration time of 11.5 seconds with manual transmission and two wheel drive. Maximum speed, where permitted, 111mph for both manual and automatic transmission models. Now available for SZ-T and SZ5 grades, the outgoing Vitara S model launched in 2016 was the first Suzuki to utilise the Boosterjet technology petrol engine which is a 140PS 1.4-litre Direct Injection turbocharged unit (DITC). This engine has compact dimensions and offers 220Nm of torque available from just 1,500rpm through to 4,000rpm. Although a four cylinder unit, the 1.4-litre engine has very similar technical characteristics to the 1.0-litre with its compact turbo charger and cylinder head design. It also employs six-hole fuel injectors and high tumble port technologies for greater fuel economy and improved power output. The turbocharger has a boost pressure of 1.1 Bar. The 1.4-litre engine offers strong benefits in performance too with a 0-62mph acceleration time of 9.5 seconds (2WD models) for both manual and automatic transmissions and a maximum speed, where permitted, of 124mph. A five speed manual transmission is fitted as standard for the 1.0-litre Boosterjet engine and a six speed for the 1.4-litre engine. Each manual transmission’s gear ratios are optimised to help provide a good combination of performance and fuel economy with additional measures added in development including a shift lever counterweight to help provide a smooth, positive shift action. Depending on grade, a six-speed automatic transmission is available optionally for the 1.0-litre and 1.4-litre Boosterjet engines. It has a wide gear ratio range to permit precise driver control and which also helps provide quick response at low vehicle speeds (for instance, when pulling away from standstill or driving slowly uphill) The wide ratios also help the engine to run at lower rpm when cruising too. The transmission has an expanded lockup range to promote good acceleration, high fuel economy and low levels of NVH. Additionally, a manual mode is fitted to enable the driver to change gear using shift paddles behind the steering wheel. When the vehicle is driven on a decline and the clutch system detects that the increasing road speed is nearing a specificied value, it will automatically engage the clutch to provide engine braking. The Vitara’s CO2 emissions are low thanks to the use of high tensile steel and other weight saving measures in the body. This has resulted in the Vitara remaining one of the lightest SUV’s in it class at just 1,160kg for the 1.0-litre two wheel drive models with manual transmission. An Engine Auto Stop Start system is also used across the range which shuts down the engine when stationary and the 1.0-litre petrol engine with two-wheel drive has CO2 emissions of just 121g/km (NEDC test). Four-wheel drive is typically seen as detrimental to fuel economy and emissions performance. By contrast, Suzuki’s ALLGRIP system enables CO2 emissions that are remarkably low for a four-wheel drive SUV. CO2 emissions for the 1.0-litre Boosterjet petrol engine and manual transmission is 129g/km (NEDC test). 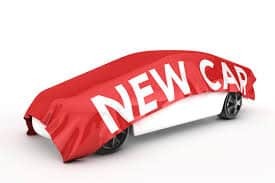 Suzuki evolved its renowned four wheel drive technologies into a new generation that delivers driving pleasure and peace of mind in diverse conditions while promoting economy and limiting the burden four wheel drive cars place on the environment. The auto mode prioritises fuel economy in typical driving conditions and uses two-wheel drive by default. It switches to four wheel drive if it detects wheel spin. The sport mode is optimal for twisty roads. The system makes maximal use of four-wheel drive in accordance with accelerator inputs. At low and mid-range engine speeds, the system alters the accelerator/torque characteristics to optimise engine response and cornering performance. The snow mode is optimal for snowy, unpaved, and other slippery surfaces. The system uses four-wheel drive by default. It optimises four-wheel drive control in accordance with steering and accelerator inputs to promote traction and stability on low friction surfaces. The lock mode is for extricating the car from snow, mud, or sand. A limited slip differential is fitted which helps brake any slipping wheel and transfer torque to the gripping wheels. On conventional full time 4WD vehicles, feedback control allocates torque to the rear wheels after detecting front wheel drive slippage. On Vitara, as well as offering feedback control it also offers feed forward control that anticipates slippage based on road surface, throttle opening position, steering angle and other factors. In summary, rather than reacting after grip is lost, it controls the vehicle to prevent grip from being lost which results in greater stability. Available as standard equipment on all Vitara models, Hill Hold Control makes hill starts much easier by preventing the vehicle from rolling backwards for two seconds as soon as the driver removes his or her foot from the brake to the accelerator pedal. This system is fitted as standard on SZ-T ALLGRIP and SZ5 ALLGRIP models. When the vehicle is traveling down a steep downward slope and engine braking is not sufficient to slow the vehicle, Hill Descent Control will automatically apply the brakes to restrict vehicle speed, thus allowing the driver to maintain full control and concentrate on steering the car safely. The front suspension is of MacPherson strut design. During the initial development of the new Vitara, revised shapes for the lower arms and suspension frame were utilised and improved struts adopted for higher rigidity and to also promote better driving stability. The rear wheel suspension incorporates a beam design (a closed section consisting of a pipe crushed to form a “U” shape) that Suzuki first adopted in the S-Cross. This beam design provides superior rigidity and ride comfort. The Vitara has ventilated disc brakes at the front and solid disc brakes at the rear. Weight savings and drag reductions in the calliper design help provide superior braking performance and also assist fuel economy. Dual Sensor Brake Support system fitted as standard on SZ5 models. Adaptive Cruise Control for more relaxed driving fitted as standard on SZ-T ALLGRIP and SZ5 models. NOTE: ESP* is designed to help keep the vehicle under control. However, the degree of engine torque reduction, the braked wheels and the brake force applied vary according to driving conditions. ESP® is essentially a system to assist stable driving. In the case of slippage or skidding that exceeds the limits of grip between tyres and road surface, ESP® will still function but may not be fully effective. *ESP is a registered trademark of Daimler AG. The Vitara’s passive and active safety systems are designed to intelligently anticipate and react to potentially dangerous situations with an excellent level of protection. One of its major safety features is Total Effective Control Technology which is a concept for occupant protecting impact absorption and low weight developed by Suzuki. Extensive use of high tensile steel and computer aided engineering technologies make the body light, highly crashworthy as well as fuel efficient. Standard safety equipment includes seven airbags which includes a driver’s knee airbag as well as seat belt pre-tensioners and force limiters. Euro NCAP’s tests on the front seats and head restraints showed good protection against whiplash injury in the event of a rear end collision and a geometric assessment of the rear seats also indicated good protection. Suzuki paid particular attention to child safety in accordance with latest European legislation and pedestrian protection received the highest score amongst its competitors thanks to the bonnet shape and structures for the cowl top and wipers. The bumpers also provide good impact absorption to lessen the degree of harm if the car comes into contact with a pedestrian. The advanced forward detection system fitted as standard on SZ-T ALLGRIP and SZ5 models supports numerous safety technologies of which collision-mitigating Dual Sensor Brake Support (DSBS) is included. With DSBS, at vehicle speeds from approximately 3mph to 62mph, if the system determines a risk of collision with a forward obstacle, it issues both an audio and visual warning. If there is a high risk of collision with a forward obstacle and the driver panic brakes, the system deploys brake assist, increasing braking force. If the risk of a collision increases even more, the system applies full automatic braking in an effort to avoid the collision or reduce damage. This system is fitted as standard equipment on SZ-T ALLGRIP and SZ5 models. When there is a vehicle in front, the adaptive cruise control system uses millimetre-wave radar to gauge the distance to it and automatically maintains vehicle-to-vehicle distance in line with the setting selected out of three possible settings. When there is no vehicle in front, the system maintains the speed from 25mph to 100mph (where permitted) as input by the driver. For automatic transmission equipped vehcles, an additional ‘Stop & Go’ function is included which can brake the car to a full stop for up to two seconds behind a stationary vehicle, before moving off when the vehicle ahead moves. Lane changing at speeds above 10mph is now made safer with the addition of the Blind Spot Monitor function. The system has two rear mounted side radar sensors that are capable of detecting vehicles located in or approaching the rear blind spots on either side of the vehicle. Once detected, a warning LED icon is illuminated in the relevant exterior mirror. If the driver ignores it and indicates to change lanes, a flashing LED icon is accompanied by a warning sound alert. When the vehicle is travelling at vehicle speeds of approximately 37mph and up to 100mph (where permitted) and is departing the lane without the driver using a turn signal, the system vibrates the steering wheel and lights a warning indicator in the instrument cluster to draw attention to lane departures caused by factors such as inattention to the road. 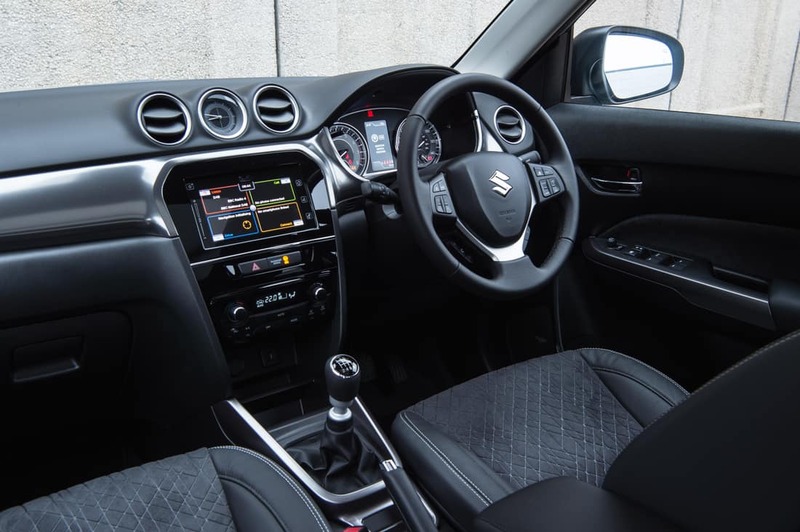 As an additional feature on the 2019 model SZ-T ALLGRIP and SZ5 Vitara, the driver will also notice an automatic input from the steering wheel at this time to ensure the car remains in its correct direction of travel. When the vehicle is traveling at vehicle speeds of approximately 37mph or above and is weaving from side to side within a lane, the system sounds a warning buzzer and lights an indicator on the instrument panel. This quickly draws the driver’s attention to weaving caused by drowsiness or other factors. 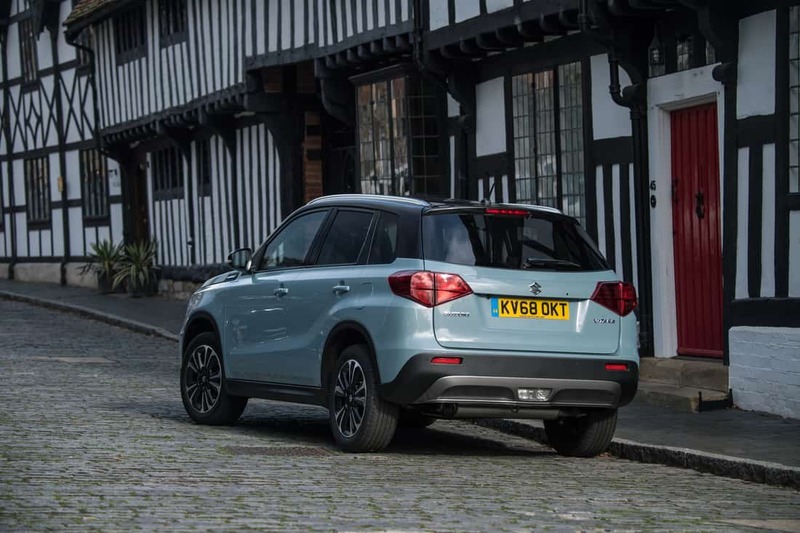 At speeds of up to 5mph whilst in reverse, the Vitara SZ-T ALLGRIP and SZ5 uses two rear mounted radar sensors to alert the driver of approaching vehicles on either side when reversing out of car parking spaces. If a vehicle is detected, the driver is given both a visual alert and a warning sound alert. This assists the driver to manouevre more safely out of parking spaces where vision may be obscured. 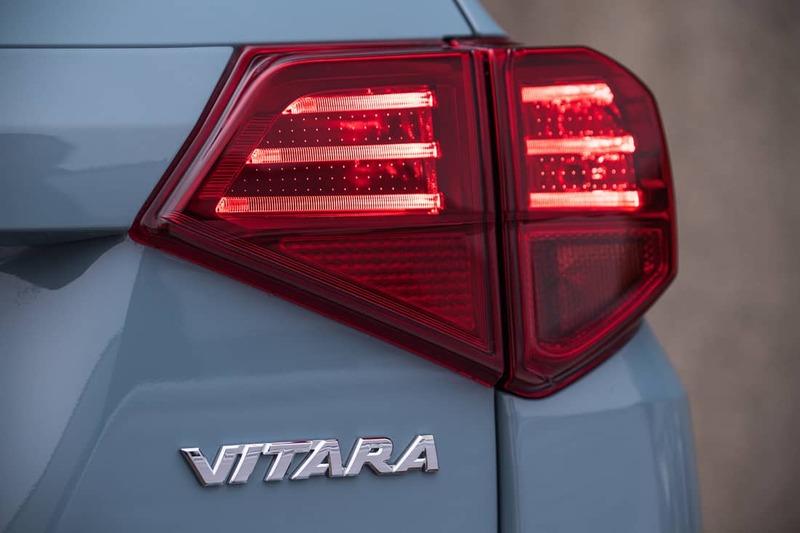 The 2019 model Vitara range utilises a unique 4.2 inch high-definition colour LCD display that shows a range of information including engine output and torque data, fuel consumption, average speed, acceleration and brake operation as well as driving G-force tracking. This feature forms part of the specification of the SZ-T ALLGRIP and SZ5 models and monitors the road ahead. When it detects signs such as speed limits, it displays the sign on the centre display and up to three can be displayed at any one time. The body embodies Suzuki’s Total Effective Control Technology (TECT) concept for occupant protecting impact absorption and low weight. Extensive use of ultra high tensile steel helps to make the Vitara outstandingly crashworthy and fuel efficient. Optimal body dimensions for SUV capability in challenging conditions. A panoramic sunroof with one of the largest openings in the class available on SZ5 grade. Smartphone connectivity available as standard on SZ-T and SZ5 grades. Generous approach and departure angles help to negotiate deeply rutted or snow-covered roads. The Vitara’s SUV packaging combines generous minimum ground clearance of 185mm with large, 215/55R17 tyres on SZ-T and SZ5 grades. Plus, an 18.2° approach angle and a 28.2° departure angle help assist the driver in various off road conditions. 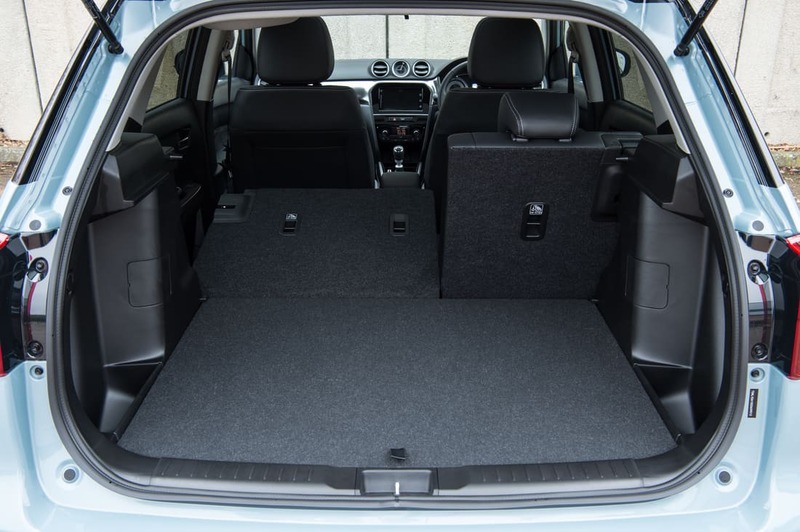 The luggage area has a capacity of 375 litres (VDA) with the rear seat in its upright position and the rear seat and luggage board can also be repositioned to suit luggage requirements. Vitara SZ5 models have a large sunroof consisting of two individually sliding glass panels which extends over the front and rear seats, making the cabin more relaxing for all occupants. When the sunroof is closed, the glass panels have a combined length of 1,000mm. When open, the aperture has a length of 560mm (one of the largest in the class), giving occupants an invigorating open-roof experience. The audio system fitted on SZ-T and SZ5 models has a Smartphone Linkage Display Audio (SLDA) with a large seven inch touch panel display that enables intuitive operation. This includes a three dimensional navigation map that makes landmarks easy to distinguish, the system also allows the driver to use certain smartphone applications with MirrorLink, Android Auto and Apple CarPlay connection. Apple CarPlay is the smarter and safer way to use iPhone in the Vitara. Apart from making calls it also facilitates receiving directions for optimised traffic conditions, listening to music, accessing email, text messages and more. PreviousRevised Renault Kadjar SUV Hits Irish Shores. NextNew KIA Sportage – Now Even More Appealing. Škoda Ireland Record Highest Ever Market Share in 2018.